After a long day, I enjoy a nice shower. It feels pretty good to stand in there and let the water pour over you. Every once in a while, I simply take a long shower. Most of the time, though, a shower is just a task to be performed as part of the normal day. With children around, it’s one that needs to be performed quickly, too. 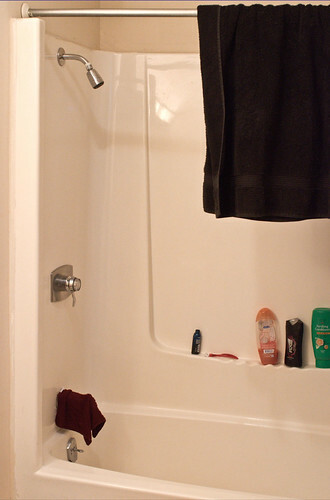 A quick shower is a less expensive shower, too. My target is a four minute shower, though I often go over by a little bit. I count those four minutes from the instant I turn on the water to the instant I turn it off. When I’m in there, I’m all business. My goal is to get clean and get out so I can get on with the other activities of the day. Of course, the real question is how much money does such a short shower really save? Let’s say that you take a twelve minute shower every day, and your shower head produces two gallons of water per minute. If you cut that down to four minutes, you’re saving sixteen gallons of water per shower, or 5,840 gallons per year. Depending on where you are, that will save you $10 to $100 a year in water usage, according to these rates. On top of that, there’s the issue of water heating. With each shower, you’re using hot water, which is either causing your tankless heater to run for a while or causing hot water to leave your tank and cold water to enter it. In either case, you’re going to be using some amount of energy to replenish your hot water. Given that energy rates and efficiencies vary greatly, let’s just assume that it takes half a cent worth of energy to raise the temperature of a gallon of water from cold to hot. That means you’ll be saving eight cents in energy costs per shorter shower, or $30 per year. Remembering that these numbers are very much a “back-of-the-envelope” example, cutting your daily shower from twelve minutes to four minutes will save you somewhere between $10 and $130 per year in water use and energy use, depending on such factors as the flow rate of your shower head, the local cost of water, the efficiency of your water heater, the local cost of energy, and the heat level of your shower. What if you like a nice long soak in the shower? Go for it, by all means. It’s a pretty inexpensive treat, after all. However, if you’re like me, the best part of a shower is getting clean. If you do that efficiently, you save both time and money.